The awards we present are a reflection of the cornerstone qualities we try to instill in each member of the ONDC. Our annual awards presentations are something each athlete looks forward to and strives towards every year! The awards we present are a reflection of the cornerstone qualities we try to instill in each member of the ONDC. We have awards based on results and single outstanding performances, we highlight our coach of the year and our most prestigious award based on sportsmanship, hard work and going above and beyond to help the club and its members. Out first award is always the Coach of the Year award. This award is in memory of one of our first learn to dive coaches, Mark Burton. Mark was enthusiastic and had a way with kids like no other. Mark left this world too soon and to honour his memory, our Coach of the Year award has been named the Mark Burton Award! It is given to the coach who has shown outstanding dedication to our club and has gone to great lengths for each individual athlete to ensure they grow to their full potential. Our next award is the Volunteer of the Year! This year we had the honour of hosting the Dresden Trials which is the largest junior diving competition in Canada each season. Over 185 athletes, 60 coaches and judges and Julie Boyer ran the ship and was able to orchestrate and organize the kitchen for this event flawlessly. Months of preparations went into the organization and execution of this event and everything ran smooth as a whistle. For your hard work and time we thank you Julie for helping us run one of the best kitchens and prepare some of diving’s best food in the country! Our next group of awards are quite new and highlight a single outstanding performance over the competitive season. For the national level this award was given to Talia Wooton for her tower prelims event at national championships. From day one our goal was to make a national final this season. This being her second national championships, and over-coming torn ligaments in her foot she put down a personal best score on tower and achieved her goal. As a coach, I could not have asked for anything greater and this is why she is receiving this award! Talia Wooton – Performance of the Year Award. For the Aspire level of diving, the award was given to Taylor Randall! 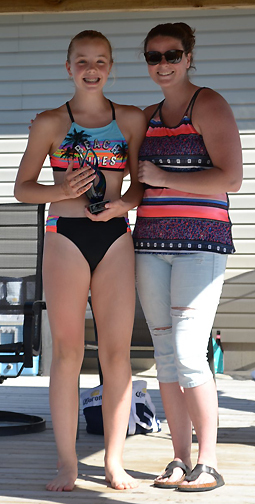 Over the entire season she has continually improved her scores, her strength and her drive which led to the most important meet of the season, provincial championships. In her 3m event she set another personal best and earned a silver medal in the event. Coach Mary was so impressed with her work ethic all season and without question nominated Taylor for this award! Congratulations Girls! As an honorary mention we livened up our membership by adding one additional performance to the list. Our speech highlighted amazing accomplishments by this person and had everyone fooled into thinking it was an athlete. The award was actually given to one of our “diving dads”, Dave Randall for his sportsmanship and participation in the Dive-A-Thon parents lesson. Coach Brennan gave the divers a parent for 45 minutes to teach them 3 dives out of a list of 15 dives and then each parent entered into a mini-competition. Not only did Dave win the competition with 10’s on every dive, he tried every single dive on the list of 15. His sportsmanship that day was too incredible not to highlight! Our next set of awards were the most improved athletes in the competitive and advanced recreational levels of diving. The competitive level was awarded to Charles-Mae Hunt. 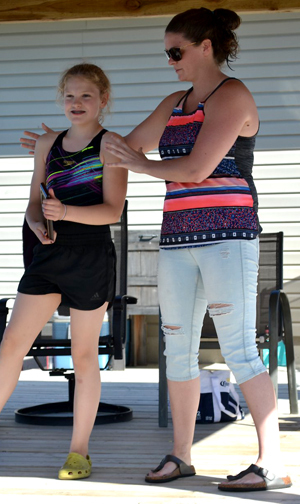 Charlee has grown leaps and bounds transitioning from the Aspire level of diving to the national stream. She has fully qualified for the 1m and 3m events at national championships and is growing into a very brave and humble athlete and will definitely be one of our role models in the coming years for our younger athletes. 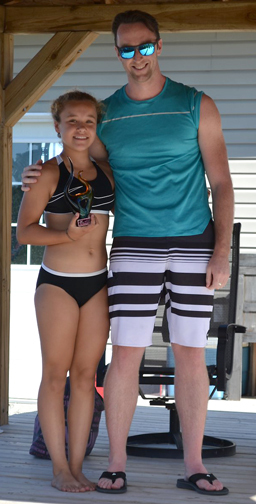 Our most improved advanced recreational diver is Erica Follow. Erica was one of our first athletes accepted into the program for her drive to continually challenge herself. Her words are “I just can’t get enough of this sport”. By continually challenging herself and showing outstanding dedication to the program she is rightfully deserved this award. Congratulations girls! 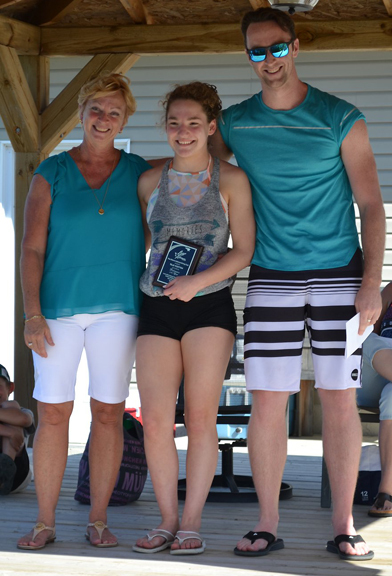 Erica Follow – Most Improved Diver – Advanced Recreational. Our final set of awards are the athlete of the year awards! This award is one that each athlete strives to achieve and we could not have picked better athlete this season to accept these awards. These awards are strictly based on performance throughout the season. Our national level athlete has placed in the top 2 in 17 out of 21 individual events so far this season. She earned a spot on Team Ontario and went on to win a Gold Medal in Cuba beating the current Pan-American Champion. Our athlete of the year is Catherine Boyer! For the Aspire level, this athlete has been on the podium 7 out of 9 times this season. She also had the opportunity to compete internationally in Cuba this season after working extremely hard to boost her difficulty in her dive list. She went on to earn a top 8 finish! Our Aspire level Diver of the Year is Caelly Nordman! Congratulations Girls! The biggest honour is our club is the Dragon Award. This award is given to someone who shows all the attributes that our club is built upon. Sportsmanship, hardworking, empathetic and goes above and beyond for the club. This year our award was not given to an individual but rather to a family. The Hunt Family + Extended Family. Their generosity and acts of kindness for the club has been astonishing this season. They have had their own cheering section at every competition, volunteered their time every single day at Dresden trials, hosted our banquet for two years now and the list goes on and on. The Hunt Family has definitely “earned their wings” as we say and we are truly thankful to have them on our team! 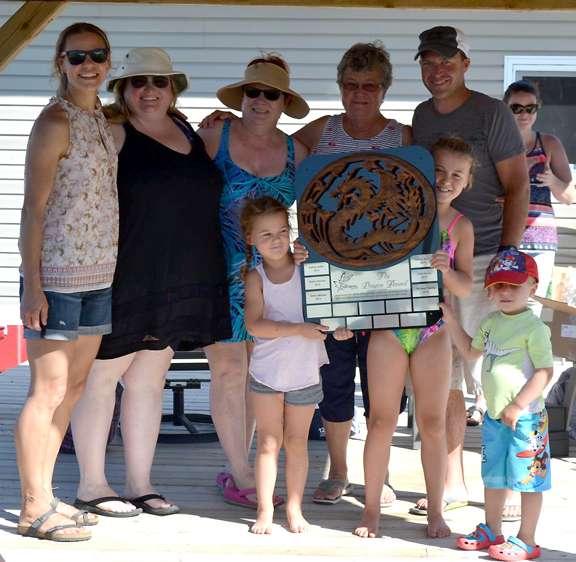 Hunt Family with Dragon Award – our highest honour. 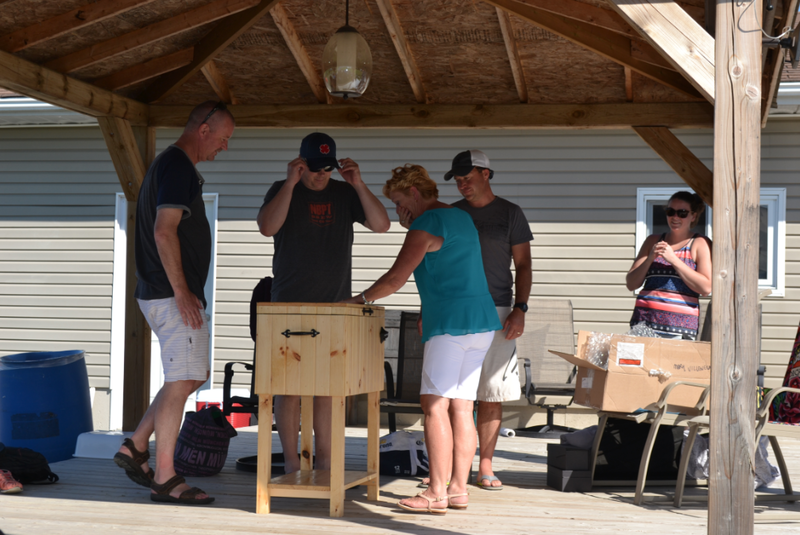 As a surprise presentation, the board of directors had the final words to honour our club founder and leader Kathleen. The amount of hours and time she dedicates to this club is unparalleled. As a small token our their appreciation they had a very special gift made for her!